This is a new one I'm working on. That looks really good. Did you apply a paint or stain?? It looks like your Shark is doing a Great job. Keith thanks for posting and I'm sure your nephew is really going to like it and please let him know I appreciated his time served!! I stained a peice of Oak plywood it prior to carving, the poly after the cariving. here one im working on for a guy that is getting promoted to staff sgt. a 12 clock for his wall. Seems like those former Marines all like plaques - at least I hope they do. Here is one I made of cherry for my brother as a surprise gift for his upcoming birthday next week (hence the blue tape over his name). After carving the plaque and a few coats of poly, I used a gel stain and a lot of wiping to fill in the v-carving. Wow, them look really great!!! I've been lurking and learning for years. 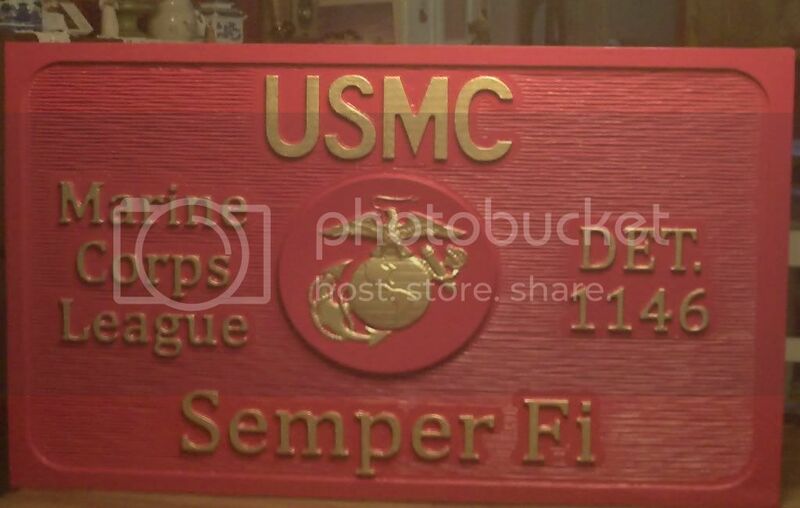 I thought I would post this sign I made for the local Marine Corps League of which I am a member. The sign is made from HDU. The 3D I purchased from 3d machinist. I made the 3D from 3/4 HDU and inserted it into the larger frame. I have what I call a modified solsylva machine that I built myself. It cuts HDU good at 65" per minute and 50 on wood. I know that is slow compared to a lot of folks but I've found that it makes for a lot less cleanup. Outstanding! I give you all "BZ's"
Hope your ready to make more stuff, once they see the sign, they'll be lining up with all kinds of Ideas. These look great. I have yet to try carving into plywood. Have you had good luck with it...any special tricks to doing that? I like the painted one. I have been looking for a model like that one. A friends son joined the marines and I wanted to make them one. I use plywood a lot for my painted things. I like to use cabinet grade Oak or Maple, finishes nicely. Cost more than regular sheeting, but nicer to work with.